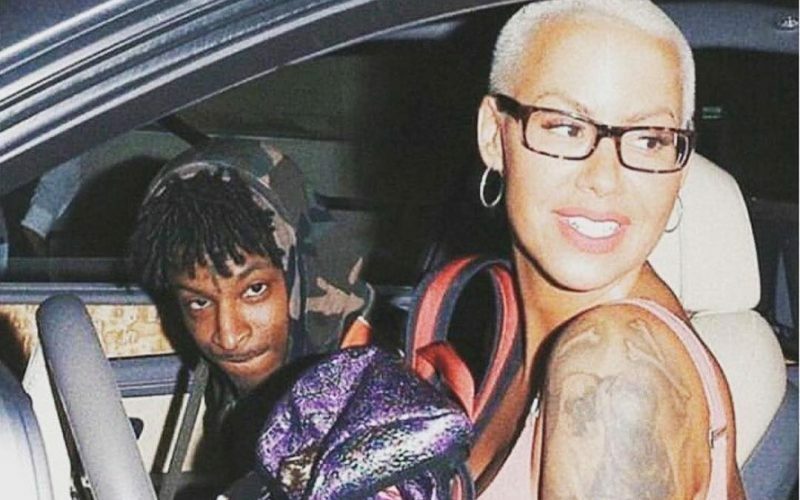 Amber Rose is sending a clear message to 21 Savage. The former couple broke up earlier this year although the real reason for their split is not yet known. In March of this year, Amber Rose opened up about the split saying that she is still very much in love with 21 Savage. Last night, she posted a video of herself on Instagram Live listening to Richard Marx classic “Right Here Waiting” and her fans have concluded that she is sending a message to the “Bank Account” rapper. Amber Rose later posted a photo of a broken heart, a sign that she is taking the breakup very hard. During her most recent interview on Big Boy Neighborhood, Amber spoke about her status saying that she is not single because she is still in love with 21 Savage. #PressPlay Wonder who #AmberRose is waiting on ? Amber Rose acknowledge the difficulties of being a famous celebrity and be in a relationship but she still hopes that she and 21 Savage can reconcile and perhaps be a couple again. Amber was previously married to Wiz Khalifa who is also now single, so maybe she could be talking about him when she posted the “Right Here Waiting” video. She has a 5-year-old son with Wiz and the two have been co-parenting pretty well. She still hasn’t revealed the reason for her breakup with 21 Savage, but the last time that they were spotted out in public they were clearly arguing. 21 Savage is so last week. What with Drake stepping on cracks on the sidewalk that turn into hits and Gambino waking up the entire virtual hood with one exquisitely crafted music video, 21 who? Just when you all were getting lulled to sleep w/ UziV, G’easy, Jayonce. Goddamn if they don’t make michael jackson a fashion conservative. I mean, huh, what?! (Passt. It’s a South thing. Chains. Cartoons.) Though that Ric Flair beat gives all’y’all extra time, just waiting for the last meal and the warden. Murder on the beat.